The Cave Creek Regional Park, one of Maricopa County's newest parks, protects roughly 3,000 acres of extremely lush desert foothills just north of the Phoenix city limits. The steep and very rocky slopes offer excellent habitat for cacti, desert trees, and many other plants. The sparse soil is very well drained, retaining little moisture. Yet the steep slopes provide profuse runoff when it does rain. 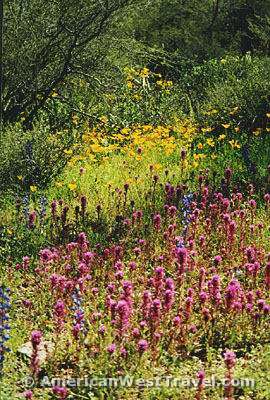 The result is exceptionally beautiful desert scenery, including spectacular spring wildflower displays following rainy winters. 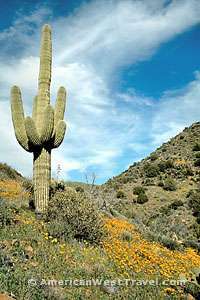 The saguaro is the largest cactus of the Sonoran Desert and its most well known feature. It is actually a rather finicky plant and thrives only in particular conditions such as those found at this park. 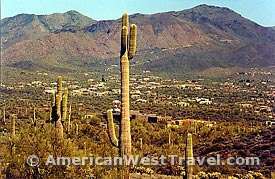 When thinking about Arizona and deserts, almost all non-desert dwelling people immediately visualize forests of multi-armed saguaros, expansive landscapes, and spectacular sunsets. All can still be experienced here. The park features a wide variety of desert plants. Watch out for the small, shiny cactus known as the teddy-bear, or "jumping" cholla. It propagates by dropping spiny links off its arms. If you brush against one while hiking, a loose piece may "jump" into your leg! Not only is this painful, but they can be difficult to remove. Look for the green-barked palo verde, Arizona's state tree. It blossoms a brilliant yellow in the spring. Also, you'll recognize the ocotillo during springtime by the flaming red flowers on the tips of its branches. Wildlife is common at the park. Birdlife is especially abundant, ranging from tiny hummingbirds to hawks. Beware of rattlesnakes while out on the trail! They are not common in the winter but may be out sunning themselves on cool spring mornings. They are not aggressive if you simply give them a wide berth. The park and surrounding area have a long history of mineral exploration. Prospectors worked the area from the 1870s, discovering minor deposits of copper, gold, silver, lead, and tungsten. Today, abandoned mines can be observed along several of the park trails. There are a variety of excellent trails through the park, ranging from short and easy to somewhat difficult. The most popular and challenging is the 4.8- mile Go John Trail. It forms a loop around Go John Mountain, the most prominent landmark in the area. The trail climbs and descends several hills and ridges, offering the visitor a wide variety of spectacular vistas. Mountain bikes and horses are permitted on the trail. A concessionaire provides guided trail rides on horseback from late autumn through the spring. Rangers provide a variety of free, guided hikes and activities for visitors of all ages during the winter months. Reservations are always strongly advised. The park's modern campground is excellent for RVs. It features large, paved sites accommodating big rigs up to 45 feet, with water and electrical hookups. Other facilities include modern washrooms with flush toilets and hot showers, and a dump station. All services and shopping are available just outside the park entrance, heading east on the Carefree Highway. The park is roughly twenty minutes from two major freeways (west to I-17 via Carefree Highway, or south to Loop-101 via Cave Creek Road), providing easy access to the entire Phoenix metro area. For more information, visit the Maricopa County Parks and Recreations web site, or call 623-465-0431. 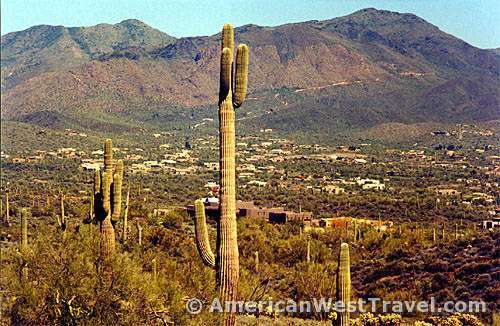 The fascinating towns of Carefree and Cave Creek are a short drive from Cave Creek Regional Park. They offer a blend of the "old" and "new" west, ranging from modern resorts and championship golf courses to art galleries and trading posts featuring western arts and crafts. Farmers' Markets are held on Friday (in Carefree) and Saturday (in Cave Creek) mornings. Check out the El Pedregal marketplace at Scottsdale Road and Carefree Highway. The famous Carefree Fine Art and Wine Festival, one of the country's top art shows, is held twice during the winter. The shows generally feature "western-oriented" fine arts and crafts, and tasting of fine Arizona wines. To view outstanding Native American fine arts and crafts, traditional or contemporary, be sure to visit the Heard Museum North. (The Heard Museum's main campus in downtown Phoenix is one of the city's finest cultural attractions.) The Cave Creek Museum includes cowboy and gold rush memorabilia as well as Native American artifacts. There are of course a wide variety of themed restaurants. Our favorite is the El Encanto Mexican Cafe in downtown Cave Creek. It features a hacienda style building with seating on an excellent and lushly landscaped outdoor patio adjacent to a pond inhabited by geese and ducks, a very serene setting. The food is inexpensive but quite tasty. Try the grilled chicken mole. For more information, visit the Carefree-Cave Creek Chamber of Commerce web site, or call 480-488-3381.